Now you are on the calendar editor, the calendar list is displayed in the top left of the screen. The calendar is created and the editor automatically switch to it. If you want to edit some of the calendars settings, click on the edit button below. 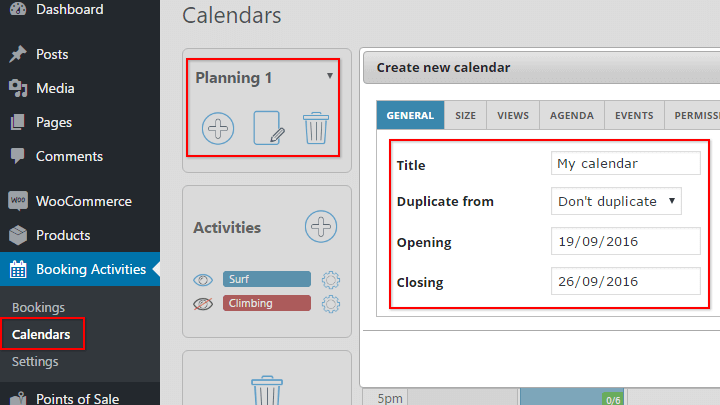 You will be able to choose who can see and edit this calendar thanks to the privilege management system embeded. To trash it, click on the delete button. But be careful, you won’t be able to find it nor use it for products anymore. Tip: Please note that in order to maintain the good operation of the booking system, this is a soft deletion, you can reactivate your calendar in database by switching the ‘active’ field from 0 to 1 on your calendar row in bookacti_templates table. Right, now that you calendar is set let’s see how to add activities on your calendar.